Ah, summer. The gentle breezes, the warm sun, the sound of a billion bugs desperately trying to get it on before dying. . .
After 17 years of underground maturation, a group of periodical cicadas is beginning to emerge in the Midwest. This particular group, known as Brood XIII, appears once every 17 years—wriggling free from the ground, shedding their last juvenile coat, and mating like mad. While non-periodical cicadas rarely live more than eight years, these not only reach the ripe old age of 17 but do so with nearly perfect synchronization. Periodical cicadas emerge in 13- and 17-year cycles, separated out by geographical range. The species in Brood XIII will infest only the Midwest (Iowa, Illinois, Indiana, Michigan and Wisconsin, to be precise), leaving the rest of the country untouched (at least until next summer, when Brood XIV emerges in 13 states). 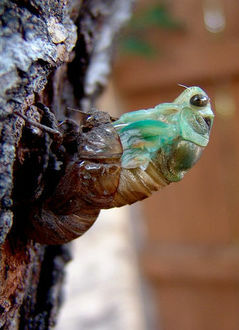 Specific species of cicada evolved into hibernating creatures mainly to avoid run-ins with predators like the cicada-killer wasp and the praying mantis. Since the hibernators are out of sight for so many years, their life cycle falls out of step with the cycles of their natural enemies, making them an unreliable food source. Meanwhile, the cicadas' insane density (their population has been known to reach 1.5 million per acre) means that the opportunistic predation bound to occur when dogs, birds and rodents see the feast set forth will have no substantial effect on their numbers. and i am not going to start.